American elections don’t normally lead to rioting in the streets, but I’m still glad I’m in a safe haven overseas where I can avoid most of the folderol. I used to think presidential elections made for great entertainment – we bought our first television to follow the 1992 results – but then something bad happened. The rhetoric got nastier, and our grandmothers’ admonition to never discuss politics or religion in polite company seemed to be forgotten. Maybe Grandma’s rules don’t apply on Facebook, or maybe my friends don’t qualify as polite company: either way, the stupidity of my fellow Americans is a constant irritant in election years. I think I exhibited impressive self-restraint in not unfriending anyone this time around. I just want the whole thing to be over so I can get back to liking people again. Of course I still want my candidate to win. 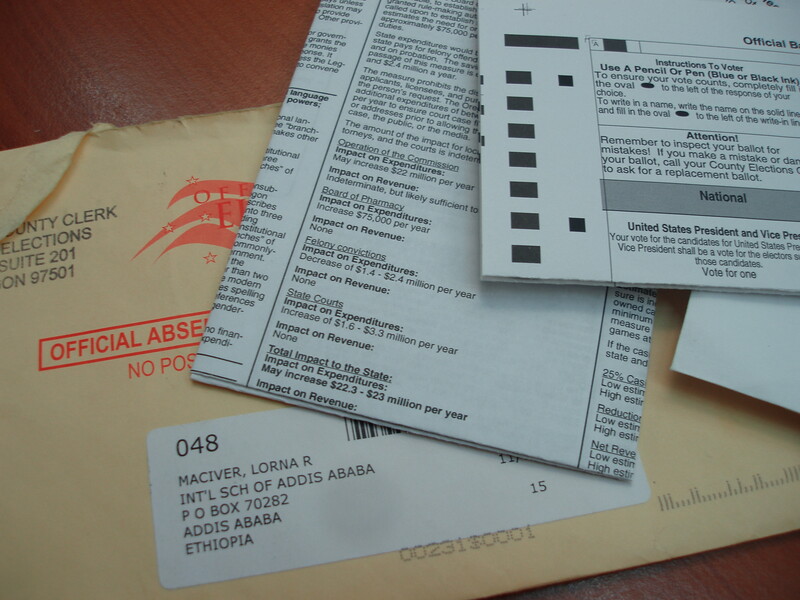 So I went through the process of registering online as a “long-term absent overseas elector.” My ballot found me all the way over here in Addis Ababa, but unfortunately not in time for me to mail it back. And Oregon isn’t one of the states that lets you scan and email your voted ballot as an attachment. So, my dear like-minded friends, I’ll have to rely on you to turn in your ballots today. I’m going to feel really bad if my man loses by one vote. This entry was posted in Expat experience and tagged 2012 election, voting. Bookmark the permalink.